Evolution and development are two different things. Allah creates the universe and the living beings through a process of development. He does not create it all of a sudden, not just like a magician taking the rabbit out of his hat out of blue. However, the creation of the first individuals could be out of nothingness. And it can be thought that, the creation of other individuals continues through certain processes of physical and natural development. In that matter, let us try to look at the issue from Allah’s perspective and make our deductions accordingly. A Master of Art, with limitless power, although he has the capability to make a limitless number of canvases and paintings, he does not make separate paintings over separate canvases, but he makes all his painting over a single canvas by making changes over the pictures/paintings. And even he uses the paints of all pictures to make new paintings! We wonder if this is logical. Does he have such a necessity or requirement? In that case, nature is just like the canvas over which individuals are painted. Now make your own decision. Which one seems more logical? Now there is no point in denying the evolution (so to speak), not in the sense of coincidental development but rather as development processes decided and created by a divine Master of Art, because there is already a development process going on in the universe, which is clearly observed. In that sense, Quran, Islam and we do not deny the existence of a limited evolution, though we do not see to label this with the name of “evolution”. There is a development going on in the universe, but it does not mean that all these things happen without anyone handling these processes. In the processes taking place before our very eyes, Allah does not create most things out of nothingness. Of course, there are things He creates out of nothing. Which ones? This is not known to us. Is this so important? We don’t think so. “How did sun come into existence? Was it formed with the reaction of hydrogen with helium, or in another way? The answers to these questions and how such processes take place are not important in terms of the existence of the creator. It is very important for us to understand that no scientific finding or no process could change the following fact: There is an order here, a result that can’t be achieved coincidentally and we have a deduction made out of this result, that is, from the fact that this visible design and art bring about certain benefits. This conclusion is the following: “This huge unconscious sun and the atoms it contains do not move on their own. They must be the result of a knowledge, will and power.” The essential purpose of Quran is to teach about the creator and the Master of Art and to prove his existence with the order of the matter. It is important to come to this point. This is the perspective in which Quran is interested. The rest is thought to be details that do not harm the real purpose. It happens this way or that way. This is the field of science. Quran leaves this completely as a free field. It says: “You should search and learn about it” and encourages the efforts in that sense. But whatever the processes and workings and the styles are, it asks us certainly to notice this order and through this to reach to the existence of the creator. Because, the order does not change, stays as it is, without being affected. What is important is to notice this fact. Quran teaches us about this order. Is it evolution, science, multiple universes or the creator? There is no need to make such a duality, differentiation, and to make a choice between them. In fact, all work together! There is only one mechanism! You can’t think of a plane separately from the law of thermodynamics. The point that we object to is why the engineer of that plane is not taken into account. This is all we care for. Can’t a creator, who created this universe, create also multiple universes? In fact, Quran starts with the expression “God of All Universes” What if there are multiple-universes; does it mean there is no creator? Of course not! The Creator could create multiple universes as well. Another important point to be made is this: once it is understood that living things cannot come into existence coincidentally, it is not important whether they do so through evolution, or suddenly out of nothingness; or how much of it is the result of evolution and how much is made out of nothingness. The important thing is that this mechanism can’t function coincidentally. Otherwise, He can decide to create through a development process, and create progressively; as long as we can see the processes. As a matter of fact he creates in this way. For instance, if the baby in mother’s womb was created all of a sudden out of nothingness, we would not have the opportunity to see that spectacular art and this splendid process. Perhaps, this is the wisdom of this truth. He does not create abruptly. This is also contrary to the secret of the trial. If creation were abrupt, without material causes, timelessly and out of nothing, they would say: “Oh, really, have a look, God creates! Could this be denied?” and out of necessity, everybody would have to accept it. Then there would be no meaning of the proposal and the trial forwarded to human beings by the religion. However, once it is dependent upon a process, time is passed by, and some causes seem to exist, it seems to be happening coincidentally. In videos, which show the formation and development of plants in much shorter times, reducing a process which takes place within weeks to a few seconds, it can be seen by naked eye how that plant comes into existence in a miraculous way. If this formation happened suddenly rather than taking place in time, there would be some drawbacks which we have already mentioned. In sum, we reject an understanding of evolution, which is based on the coming into existence of living beings by evolving and multiplying from each other on the grounds that it is not only against divine wisdom, power and divine revelation but also there is not enough evidence all over the world supporting such an allegation. Since development (or progression), that is the act of creation and development within a certain time period is a visible reality, we accept its existence. However, we do not find it appropriate to use the term “evolution” which is used for species of living things evolved from each other through mechanisms based on coincidence. Our second point is related to the explanation of the miracles in Quran with some scientific findings. 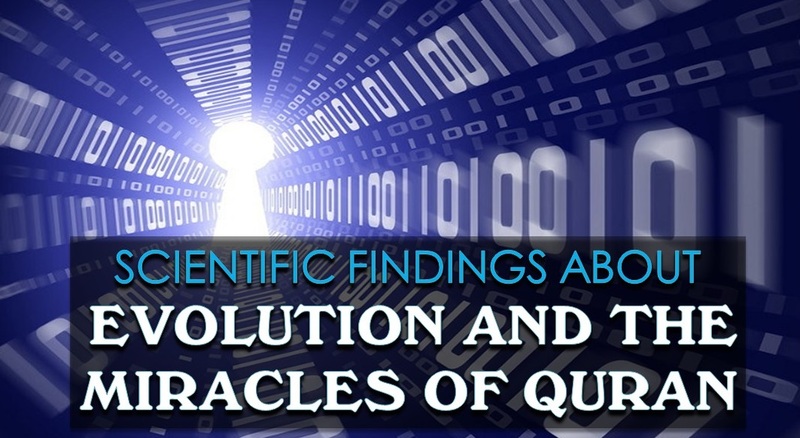 In our opinion, trying to prove the miracles in Quran by explaining them with scientific findings has important limitations. For instance, let us say, sometime later, it is proved that these scientific findings are false, then what happens? Would it prove that Quran is wrong? Then it can be said and it is in fact said that: “You just come up after these scientific findings are discovered, just because Quran is indicating them. Where have you been until this time? Therefore, we should not depend on them. They could just be used as nice arguments to prove that they are not against indicators, signs and scientific findings. However, basing the reality of our case just on scientific findings could do harm to it for the reasons just mentioned above. We see Risale-i Nur as a way that does not base the truth of Quran and Islam on scientific findings but rather develops totally original evidences. In this sense, we think, it is a very specialized book. Maybe there are hundreds of books explaining the miracles of Quran, and most of them are useful, nice books. However, Risale-i Nur brings before us a much wider road, which is more strong and based on Quran’s truths. It goes through the fundamentals with unshakable and unchangeable evidences. The evidences brought about by Risale-i Nur will be constant and unaffected after 100 years and even 200 years whatever scientific novelties are revealed. They can be understood, used and accepted by all; they won’t change and you can use these evidences until the day of judgement. This is why, in our personal opinion there is not a second example similar to Risale-i Nur from this perspective. Tags: A Journey of Discovery for an Extraordinary Treasure: Risale-i Nur (The Treatise of Light) Training Program, ACADEMIC PROOF OF THE CREATOR, Allahın ispatı, büyük patlama, bediüzzaman said nursi, bilim, canlılığın meydana gelmesi, Evolution, Explanatory Texts for Risale-i Nur (The Treatise of Light), Her Şeyin Teorisi, izahlı risale-i nur dersleri, keşif yolculukları, New Perspectives from the Treatise of Nature, Risale-i nur dersleri, risale-i nur eğitim programı, Risale-i nur izah, Risale-i Nur izah metinleri, risale-i nur sohbetleri, Risale-i nur şerh, Scientific Findings, Scientific Findings about Evolution and the Miracles of Quran, tabiat risalesi açıklaması, tabiat risalesi açılımları, tabiat risalesi izahı, tevhid dersleri, tevhid hakikati, the Miracles of Quran, varoluş, yaratıcının ispatı, yaratılışın ispatı | Permalink.